Stand-in striker Tyler Roberts rose to the occasion with two goals as Leeds United held on to top spot in the Sky Bet Championship with an impressive victory over Preston. Leeds, fielding an unchanged side from the one that drew at Millwall on Saturday, shrugged off a slow start to play some scintillating attacking football in the first half and thoroughly deserved their one-goal lead at the break. It should have been more, but the final ball let them down at times and Mateusz Klich missed two one-on-ones with Preston keeper Declan Rudd. Preston had the first chance with Callum Robinson’s bending shot from the edge of the box requiring a fine save at full stretch by Bailey Peacock-Farrell. A more routine save by the home keeper denied Daniel Johnson as the visitors in the first 10 minutes threatened to do what they did to United when they beat them in the Carabao Cup at Elland Road. Slowly the Whites got on the ball, however, and began to carve out opportunities. The first saw Samu Saiz’s goalbound shot from the edge of the box being well blocked by a defender. Klich missed the first of his big chances on 13 minutes when Jack Harrison put him clean through, but he pulled his shot wide. Tyler Roberts brought a save out of Rudd with a low snap shot and Ezgjan Alioski rounded the keeper to put the ball in the net only for a late offside flag to deny him a goal. Leeds did finally have the ball in the back of the net legitimately on 38 minutes as Liam Cooper met a corner to send the ball goalwards with a low diving header. Rudd got his hand to the ball, but could not keep it out of the net. United stayed on the attack as Harrison cut in from the right only to see his shot blocked by a defender and a minute later Klich was clean through again from Saiz’s astute pass, but this time chipped the ball over the bar. Rudd was forced into the action again soon after, beating away Alioski’s angled drive and Preston were relieved to be only one down at the interval. They started the second half better, but United were still a threat with Pontus Jansson getting to Barry Douglas’s free-kick only to send his header sideways instead of towards goal. From the corner that resulted, Alioski crashed a volley over. At the other end Josh Harrop had the ball in the net only to see another late linesman’s flag to go up for offside. The game went through its first stodgy spell, but United came out of it to finally get the rewards their play deserved. Harrison hit the post when clean through from Saiz’s pass, but two minutes later Roberts got his first senior goal for Leeds with a terrific finish from a tight angle. It got even better for Roberts nine minutes later when he headed home Klich’s lovely chip into the middle. It could have been more in the closing stages, but United saw the rest of the game out well to complete one of their most impressive wins so far this season. 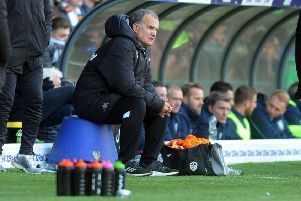 Marcelo Bielsa was delighted with the result and performance of his team. He said: “The first half was very good. The second half at the beginning was harder and then we dominated. “Our offensive and defensive games were good. There were few things to criticise. “Our team was very dynamic. Teammates were moving well to create space for other teammates. “The individual performance of each player was high. They all deserved congratulations. “Tyler Roberts started pre-season later than the others, but he has done many efforts. I asked him to play as a right winger, but I heard he likes to play number nine and the circumstances offered him the chance to play where he wanted to play. Leeds: Peacock-Farrell, Ayling, Jansson, Cooper, Douglas, Phillips, Harrison, Klich (Forshaw 87), Saiz (Baker 90), Alioski, Roberts (Dallas 85). Preston: Rudd, Fisher, Clarke, Davies, Earl, Browne (Gallagher 79), Barkhuizen, Johnson, Harrop (Barker 71), Robinson, Moult (Nmecha 79).